We started our trip in Napa Valley (we did venture to Sonoma for dinner/shopping one night too) and stayed there 2 nights before heading to San Francisco, where we stayed for 3 nights. Our parents stayed with the boys and 5 nights definitely felt like a long time to us to be away from the kids, but we had the greatest trip and made some wonderful memories, so we are super thankful we were able to get away just the two of us! 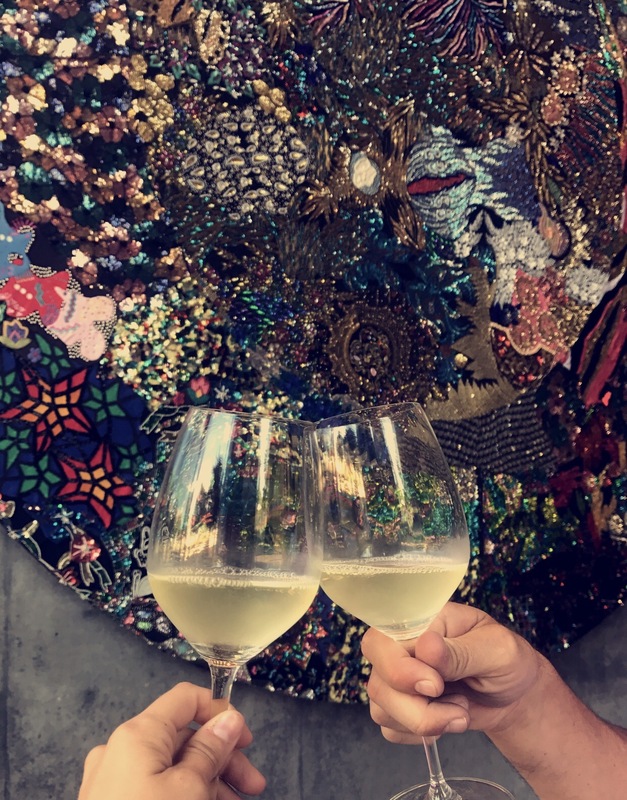 I'm going to spend this post recapping our time in Napa and then I'll do another post all about our time in San Francisco. Since this wasn't our first time visiting Napa (my first post from 6 years ago is here-with a lot of other recommendations for first time visitors) we went at a more slower pace, but still packed in so much. Napa is one of those places that it's best to have an itinerary written/planned out way before you go because a lot of the wineries require reservations and will book up weeks in advance for their tours. I spent hours researching which wineries to visit and really feel like we hit THE BEST of the best...my gosh, all of them had the most stunning grounds! We were truly in heaven with the views + the wine..
Newton Vineyard was our first winery tour + tasting and it set the bar high, to say the least. It's situated at the very top of the gorgeous Spring Mountain in St. Helena and the views are absolutely breathtaking. Definitely the most gorgeous grounds of any vineyard we have visited! We were lucky enough to have a private tour with JJ who showed us their famous English gardens, barrel caves, and enjoyed their spectacular wines in their tasting room. We didn't want to leave, but who would when you have views like this? HALL-Tours starting at just $40, you really get the full experience here. It is a 33-acre property at the base of the Mayacama Mountains. It has over 35 pieces of contemporary art, this 150 year old site has something for everyone. A lawn for relaxing...beautiful architecture...and history! It is owned by Craig & Kathryn Hall whos vineyard collection features five Certified Organic estates producing classic Bordeaux varietals. HALL’s highly rated wines include the Napa Valley Cabernet Sauvignon, selected as Wine Spectator’s #18 of the ‘Top 100’ in 2010 and the HALL 2008 “Kathryn Hall” Cabernet Sauvignon that earned #2 Wine Spectator “Top 100” Wines. We are actually thinking about becoming members here...the wine is that good! HALL has two tasting vineyards in Napa Valley-one in St. Helena (this is the one we were at) and Rutherford. Make reservations here. V Marketplace is a great place to shop. They have kids boutiques, chocolate shops, a few spots you can do wine tastings, and womens shops too. We had some of the best meals of our life here. I'm not kidding when I say we had the best overall experience and yummiest farm to table dinner at Farmstead at Long Meadow Ranch. It was my favorite restaurant I've ever ate at! From the gorgeous setting, drinks and cocktails, appetizers, and delicious entrees it is an absolute must when visiting Napa. Make your reservation ahead of time (like 3 weeks!) and arrive a little early to sit outside to have a drink or stroll through their gift shop! Boon Fly Cafe for brunch was also a huge favorite. SO SO GOOD. It's located right down the street from Domaine Carnernos winery so we came here to eat right before our tasting. One of my top 5 brunch spots for sure! Another place to add to your list is Bouchon Bakery for coffee, pastries, breads, and various desserts. Their macarons were to die for. After our hot air balloon ride, we got coffee's and sat outside on their cute patio. Try the sea salt caramel macaron and you won't be disappointed! V Marketplace is literally right across the street from Bouchon Bakery so you can get your coffee and head over to the shops! We drove over to Sonoma on our second night to eat at Girl In The Fig. This restaurant is extremely popular and has rave reviews and it lived up to all it's hype! We LOVED it here. Highly recommend. Afterwards we had some drinks at Hop Monk Tavern that was a really cute bar + had live music. A lot of people have asked me how many days I would recommend staying in Napa. I thought we saw most of Napa on our last trip and that was totally false (although we did see a lot!) I definitely think you can see almost all of it in 3 days, but I would LOVE to go back and do Napa and Sonoma for 4-5 days. Plenty to do and plenty of good wine to drink! If you're looking for other rec's or wineries to visit, make sure to check out my first post! Great Napa recs! Going to bookmark this site for when I actually make it out there, hopefully sooner rather than later. Looks like a great time! I am going to save this post, I've wanted to go to Napa for awhile so its always good to have ideas for when I make it happen!